Natasha’s wine tours are filled with scenery, history, and most of all, introductions to some of British Columbia’s finest wines. Natasha Mitchener, owner / operator of Wine Tours Gone South, has had the luxury of watching the magical vineyards evolve since moving to the Osoyoos / Oliver area in 1978. 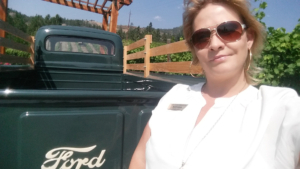 She has always found the South Okanagan vineyards to be a special and tranquil setting, and she knows the area and its history extremely well; a great asset for a wine tour operator! There are many unique boutique Osoyoos wineries to explore. Natasha can help you plan a wine tour that explores the best wineries in Osoyoos for an adventurous wine tasting experience. Oliver provides a taste of little Europe with over 20 wineries to visit and many orchards and vineyards dotted throughout the landscape. Talk to Natasha to book a wine tour that takes you through the heart of BC’s wine country. Most other wine tours in the area have set days, times and routes. But, Natasha’s tours are flexible and customized to you, your schedule, and your interests. Natasha is your guide, tasting teacher, and winery aficionado. She is passionate about sharing her love of Okanagan wines and wineries, and for each of these boutique wine adventures, Natasha will be your host and available to answer all your questions.